One day in early August, I looked over the the industrial stairs leading to my bedroom and thought, wow, that white looks a little dingy. So, in typical fashion, instead of settling on a good scrub and a little touch up, I figured they'd be completely better stairs if covered with...animals. So, I did scrub them and then started painting a snake. The snake took form about two hours later and I stared at it for another two with pride. That snake covered one half of one riser. But I was so pleased with myself, that I kept looking at it with pride for another week without painting another dot. Porter wasn't as proud. "Don't you love the snake?!" "Yes, but I know you. We're gonna have stairs with one snake for the rest of time." A challenge! So I painted another snake and developed grand visions of a whole staircase menagerie. Bird wings! Cheetahs! A whole Noah's ark. 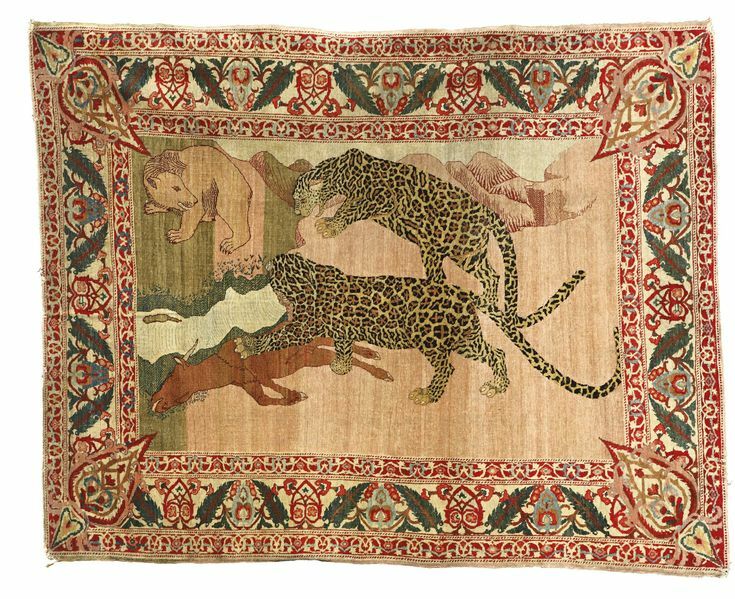 Something like this Amristar pictoral rug from India that Sotheby's is auctioning off on Oct. 1. But then I saw the bathroom that the brilliant India Mahdavi designed at the Villa des Alyscapms in Arles, France and everything changed. The wallpaper (and the marble!)! That was exactly what the snake needed. So, I started making squiggly shapes and painted them in. Where a snake with a very nice highlight down its back takes about two hours, random shapes are somehow like the Sistine Chapel ceiling. I forced myself to knock off the ridiculous detailing, which was akin to painting with a single hair, and scribbled in the main bits. I actually liked this loose version more - like a poor man's Le Corbusier/Jean Cocteau! - but I'd already started with the Type A mania, so I soldiered on with the micro brush. Painting stairs sounds fun and simple, but the hardest part is contorting your body. I laid across them, kneeled on them, three quarters-bottom rested on them. Every maneuver starts like a nice yoga move. After about 10 minutes, blood circulation is lost, percentages of the body you never thought could tingle are tingling, and your posture is like Quasi Modo's. Not fun, but it gives you an excuse for multiple-day breaks between little sections. 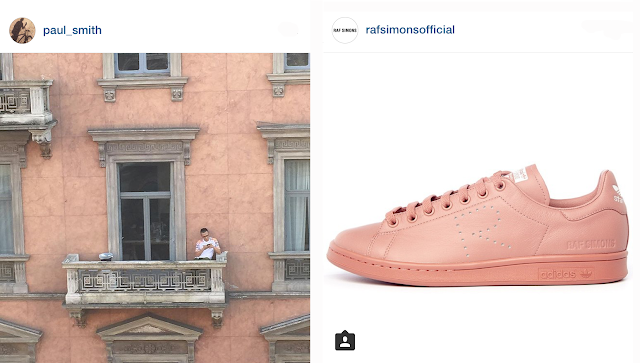 In the midst of working on the Sistine Chapel portion, I pondered the next level and knew it had to be pink, dusty, rosy pink, like the Raf Simons for adidas Stan Smiths that I'm dying to get next spring (if I don't get the bronze). I thought pink marble might be fun, but agate would be even better. I found a beautiful quartz one and there was level two. 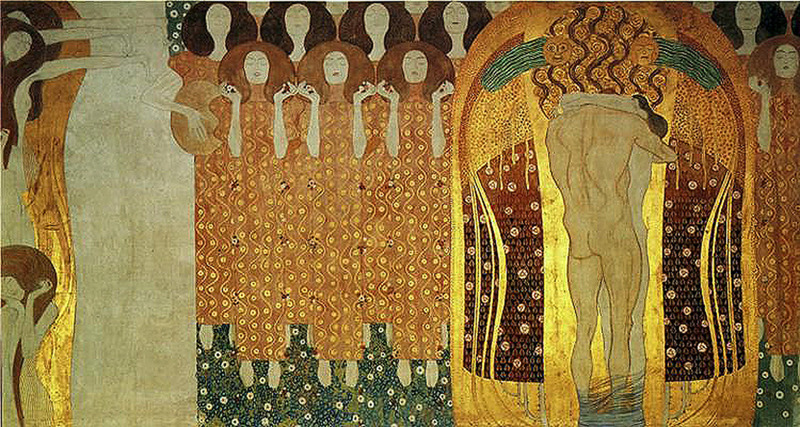 Ever since my Vienna trip last year, I've wanted to create a Klimt-like pattern with highlights of gold leaf. Gold acrylic paint is much easier, so I went with that and painted stripes of random thickness with a raw umber band across the top. When finishing the left half, I fell in love with the masking tape lines, so I ended up recreating those, painstakingly, with peachy paint. Damned masking tape. And for the bottom stair, I looked left to my mini-bar that sits on top of a slab of Italian marble that I found at a junk shop for $50. In the end, that one ended up being the simplest and my favorite of the four. Of course. Check out the @hoveydesign instagram feed for some very simple DIY tip videos that show how easy it is to marbleize like this! Now that I've conquered the stairs, I might be onto the doors...or FLOORS! I love these stairs! The marble is my favorite too. Dammit! You did it! Congrats! It looks fab!